River Terrace opened formally in September 1937, with the completion of the first 12 of 600 planned units. At the time, segregation ruled most aspects of life in Washington, and the project’s developers restricted these moderately priced homes to whites. They touted River Terrace as conveniently located near public transportation and only a quick trip away from downtown, and they promised a shopping center, playgrounds, and other amenities. After racial housing restrictions began falling away in 1948, African American families began moving to River Terrace but were met with harassment and vandalism. White residents began moving away, and within a few short years the neighborhood was majority African American. 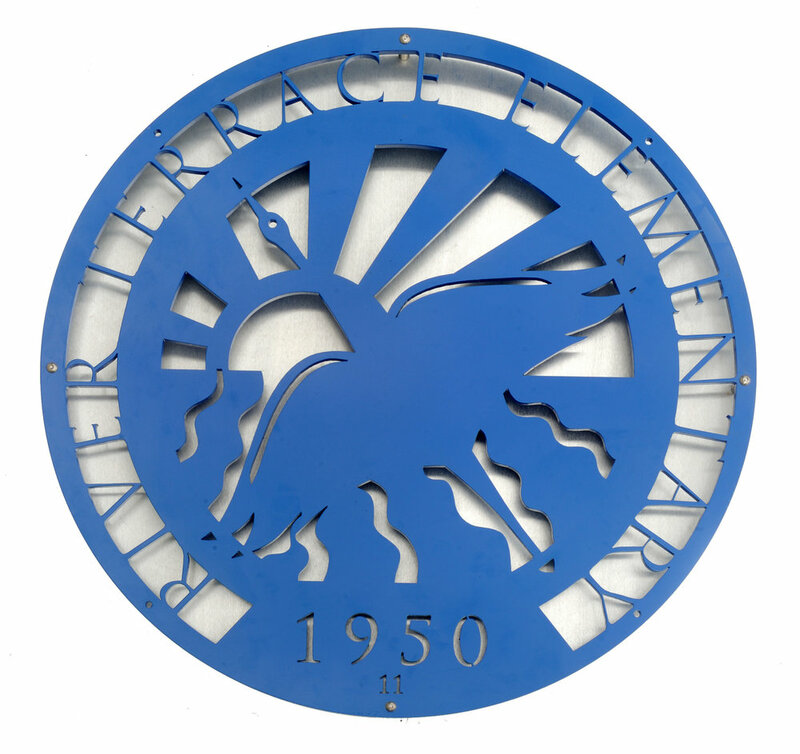 River Terrace Elementary School—originally authorized for white children—opened instead for African American children in 1952. Two years later, all D.C. public schools desegregated after the U.S. Supreme Court ruled segregated schools unconstitutional. River Terrace became a solidly African American community in the 1950s, and the city itself was majority African American by 1957. Over the decades, River Terrace residents have come together to fight pollution from nearby industrial facilities, as well as to organize sports teams, cleanups, social and civic organizations, parades and picnics, and, in short, to build a strong community. These 18 medallions tell the history of the River Terrace area from 10,000 years ago to the present. 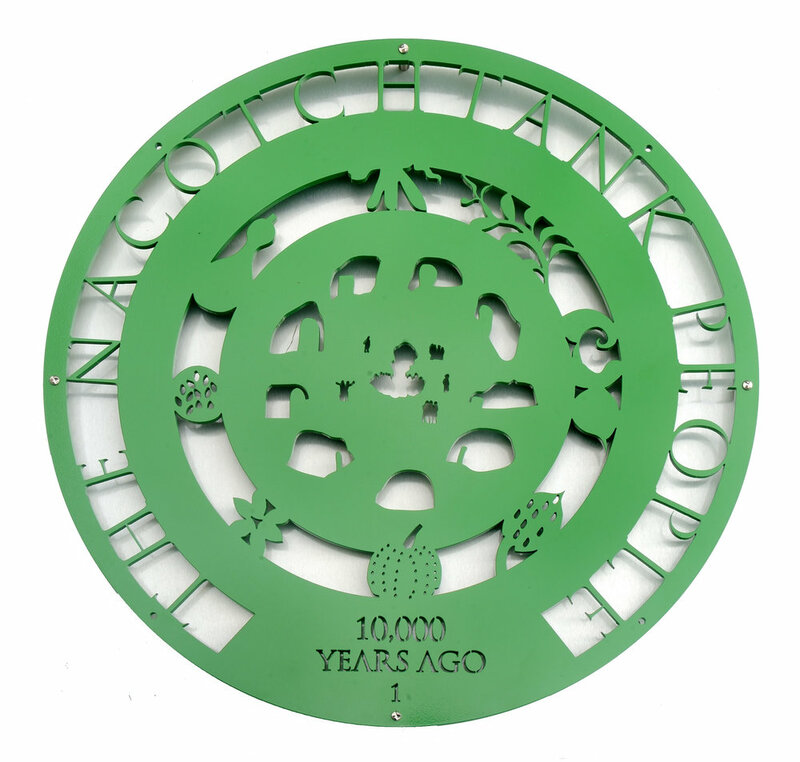 This medallion depicts a Nacotchtank village surrounded by the “Three Sisters” plants: beans, squash (pumpkins) and corn. These were interplanted to fix nitrogen (beans), provide structure (corn stalks as poles for beans), and reduce weeds (pumpkin/squash leaves). This innovative planting technology was highly effective. The Nacotchtanks were an Algonquian people who lived along the southeast side of the Anacostia River in what is now the District of Columbia. Their village is believed to have been a major trading center and the largest of several Native American settlements in the region. After the arrival of Europeans in the 1600s, the Nacotchtanks were driven away or died of diseases brought by the settlers. All that remains of them is an anglicized version of their name: Anacostia. This medallion depicts the Anacostia watershed and its tributaries, wild rice and wild oats, fish and wild birds. These flora and fauna existed into the 20th century, but pollution—and the destruction of the wetlands along the river’s edge—severely reduced them. Happily, recent cleanup efforts have helped lead to their return. 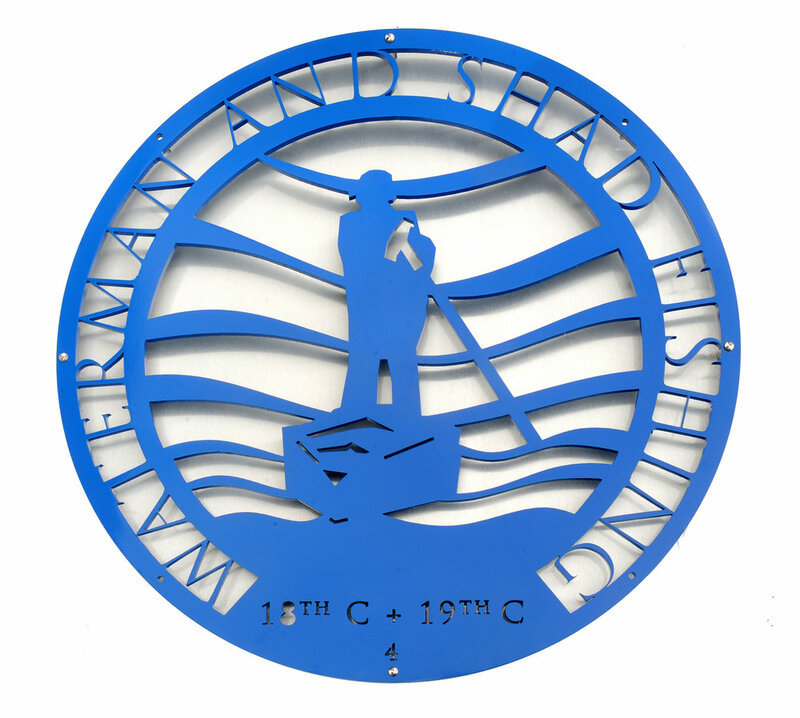 The left side of this medallion depicts John Smith exploring the Anacostia River in a shallop, an open boat used in shallow water. On the right is a typical European settlement with a cabin, split rail fence and garden. The settlers brought many changes to the Anacostia: deforestation, agriculture including tobacco plantations with slave labor, and soil depletion and silting. The river became a commercial waterway to Bladensburg―a port established in 1742―providing a livelihood for generations of men, African American and European American alike. This medallion depicts a waterman poling his boat along the Anacostia’s shallow water. Through the 19th century, shad abounded in the Anacostia River, but pollution, loss of spawning habitat and overharvest decimated this once economically important fish, and many other species as well. Both before and during the Civil War African American watermen played a significant role here in the Underground Railroad. The river also served other important functions, including baptisms. 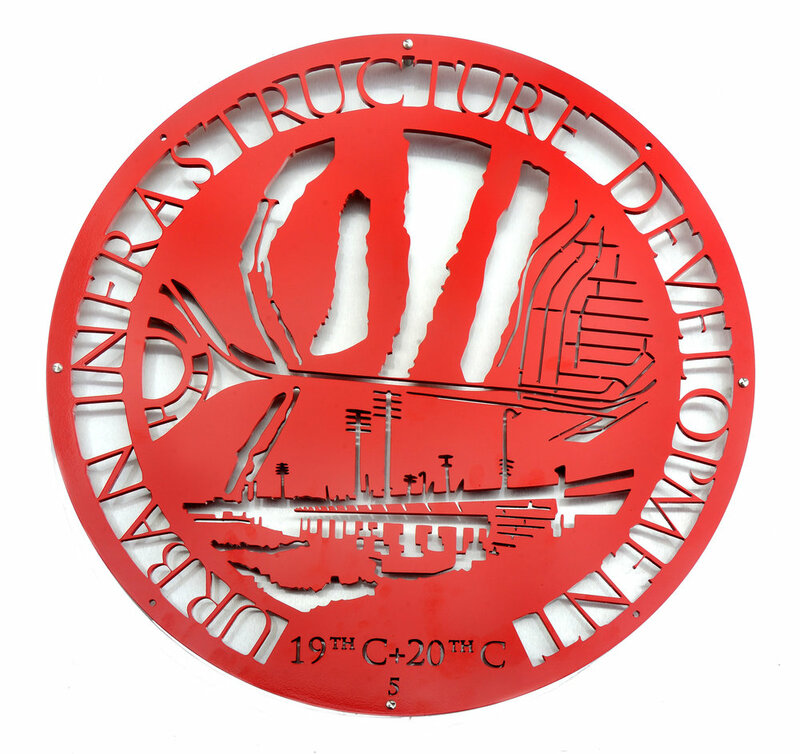 This medallion depicts the Benning Road Bridge, the River Terrace street grid, Kingman Island and I-295, as well as Benning Road and the 1961 D.C. (later Robert F. Kennedy) Stadium. The now picturesque riverfront lets us forget the long history of industrial use here. Huge operations lined the river, including the Washington Navy Yard (estab. 1799), Washington Gas Works (1888), and PEPCO power plant (1906), along with slaughterhouses and even a Briggs Ice Cream plant. The first Benning Bridge was built in 1800, the B&O Railroad in 1874, the East Capitol Street Bridge in 1954, and the freeway in the late 1950s. Kingman Island was created in 1926 from material dredged from the river bottom. 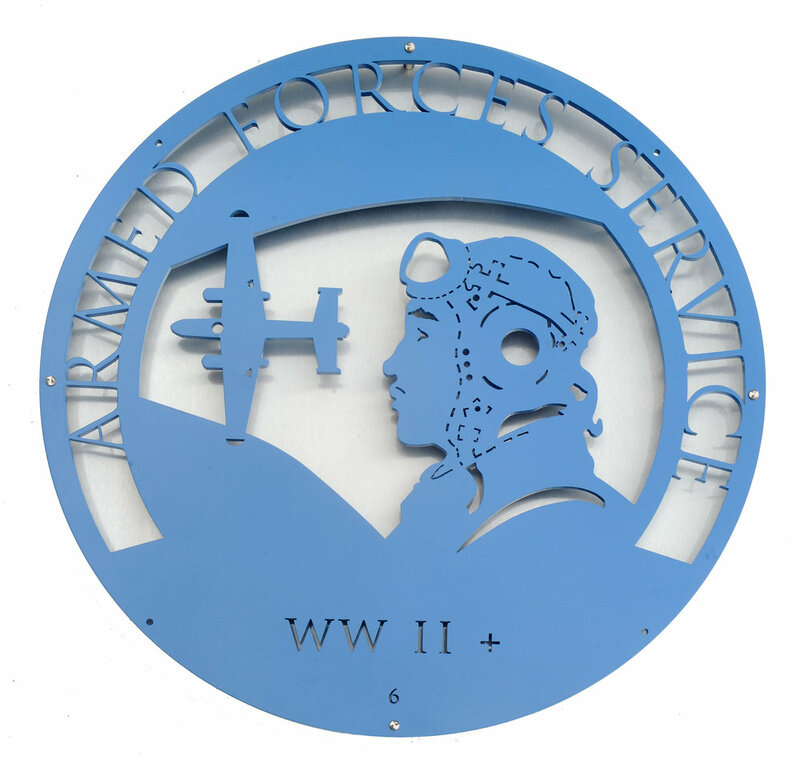 American military aviators in an era when racial segregation and discrimination prevailed in the armed forces, and throughout the United States. This medallion depicts the Pepco Power Plant, which operated across Benning Road for more than a century. It shut down in 2012 thanks in large part to the efforts of River Terrace’s George Gurley and other environmental and health activists. The neighborhood has also had to contend with the Kenilworth Dump (1942-1968) and its attendant toxic runoff and smoke from open burning, a trash transfer station, illegal dumping in the area, and combined sewer overflow outlets that allowed raw sewage into the river. 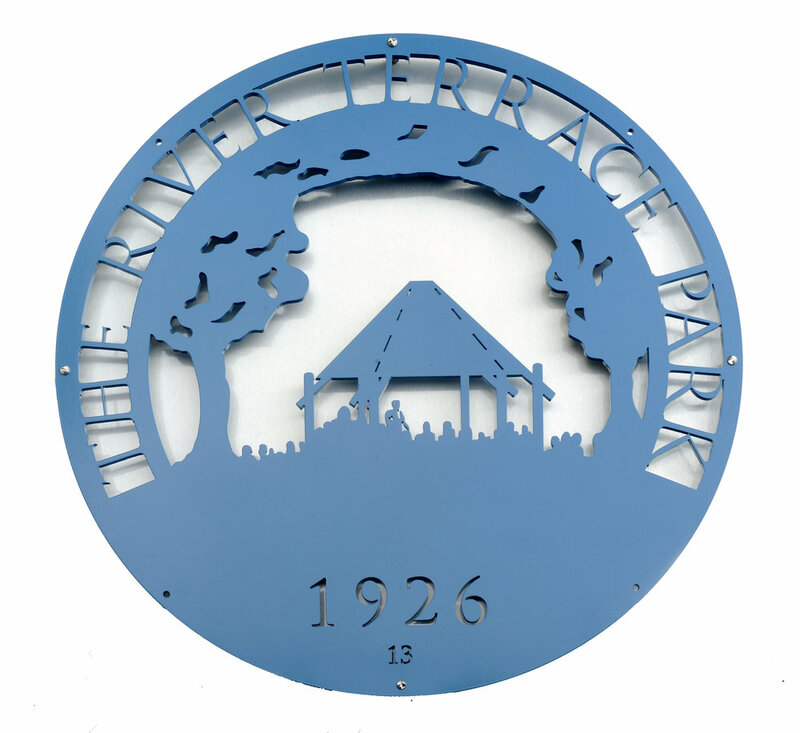 This medallion depicts the early development of River Terrace: its rowhouses and street grid, as well as the transportation arteries that connect the community to downtown Washington, D.C. Designed by prominent D.C. architect George Santmyers and built in 1937 on 65 acres of undeveloped land, River Terrace was originally restricted to white occupancy. Most houses were designed to sell for less than $5,000 each, and the community was advertised as conveniently located “eight minutes from downtown Washington, with street cars and buses close at hand.” The River Terrace Shopping Center opened in 1940. 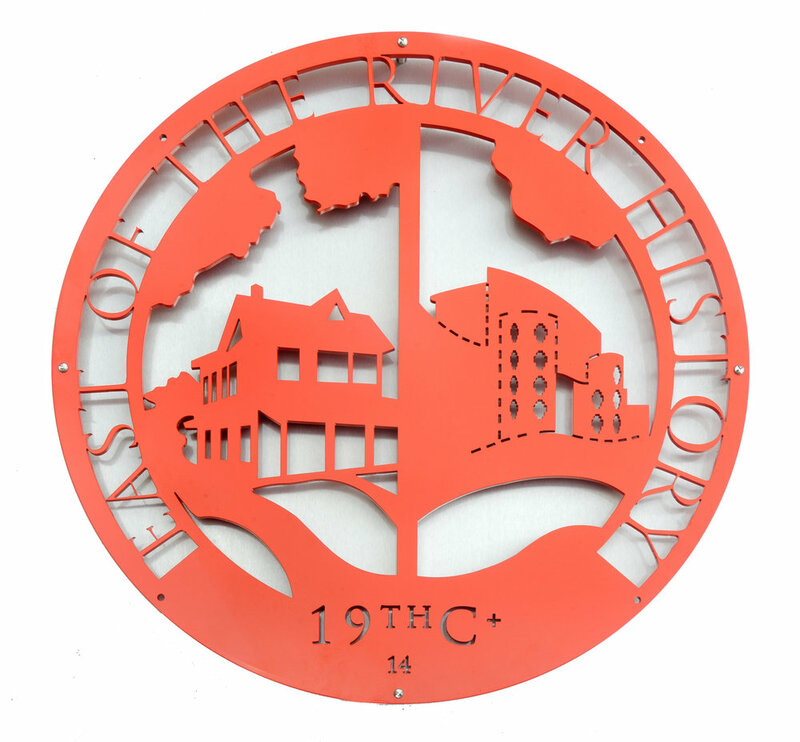 The choir members singing with outstretched hands depicted on this medallion symbolize the important role churches have played in the life of River Terrace. In 1947, River Terrace Episcopal Church congregants held their first service at their new building in River Terrace, at Anacostia Avenue and Clay Street. Varick Memorial African Methodist Episcopal Zion Church took over the building in 1972. Twelve years later, Varick AME Zion congregants opened their brand-new church building at the same location, and they continued to serve the community in 2019. The 1984 church building was designed by prominent African American architect Charles I. Bryant. His firm’s successor, Bryant Mitchell (along with Fanning Howey architects), designed the extensive renovation of River Terrace Elementary School, which reopened as River Terrace Education Campus in 2015. This medallion shows a group of 1960s-era “Lawn Rangers” who are taking a break from working on the community flower bed at Anacostia Avenue and Clay Street. In 1949, a year after the U.S. Supreme Court ruled against certain housing restrictions, River Terrace witnessed the arrival of its first black homeowners. These pioneers endured hostility from, and even vandalism by, white residents opposed to the community’s integration. In 1950, the River Terrace Community Organization (RTCO) formed to promote and protect the interests of all of the neighborhood’s residents. More recently, the RTCO has sponsored River Terrace Day and Parade, the River Terrace Christmas Party, the River Terrace Community School, Girl Scout and Boy Scout troops, and the River Terrace Recreation Center. River Terrace Elementary School first opened in 1952. Over the decades, the school served not only as an education facility but also as a community center, polling place and venue for meetings of the Advisory Neighborhood Commission and other local groups. The school closed in 2012 and, after extensive renovation, reopened in 2015 as River Terrace Education Campus. 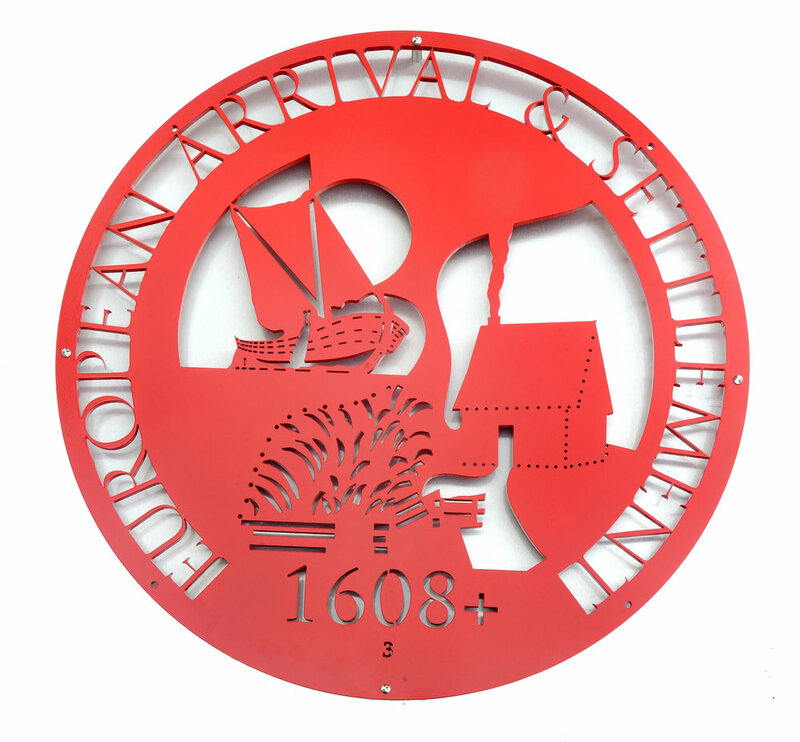 The crane depicted on the medallion is the current school’s mascot. The River Terrace Junior Athletic Club, formed in 1961 by Coach Melvin J. Watts and Coach Roland Wallace, competed as the River Terrace Rams in football, baseball, and basketball in the D.C. Boys’ and Girls’ Clubs, as well as in Maryland, Virginia, and Pennsylvania regional leagues. The Rams’ record includes two undefeated football championship seasons (1962-63), and many River Terrace players went on to play for D.C. public and Catholic high schools. The River Terrace Ramettes were the teams’ cheerleaders. This medallion depicts a Rams team on the athletic fields on the National Mall. Note the Washington Monument in the background. River Terrace Park is officially Section F of the National Park Service’s Anacostia Park. Constructed in 1926 on reclaimed land along the Anacostia River, the park provides a gathering place and “front yard” for the community. The River Terrace Lawn Rangers tended a community flower bed at Anacostia Avenue and Clay Street in the mid-1960s. Park amenities including a gazebo, tennis and basketball courts, and a playground were added in the 1970s. The medallion depicts a young Mayor Marion Barry addressing the community from the gazebo. This medallion celebrates some of D.C.’s important institutions located east of the Anacostia River. Founded in 1967, the Anacostia Community Museum has focused on the neighborhood, African American history and now urban communities. These topics, and strong links to the neighborhood, have made this museum a model for community museums around the world. The Frederick Douglass National Historic Site honors “The Lion of Anacostia,” one of the most important Americans of the 19th century. St. Elizabeths Hospital opened as a pioneering mental health facility in 1855. Today a portion of its campus houses the U.S. Coast Guard Headquarters and the U.S. Department of Homeland Security. Historic Anacostia, one of the city’s architectural gems, was placed on the D.C. Inventory of Historic Sites and the National Register of Historic Places in 1978. The opening of the Anacostia Metro Station in 1991 represented a significant step toward ending the isolation of the east-of-the-river neighborhoods from the rest of D.C.
For nearly fifty years the Chateau, at 3439 Benning Road, brought the community together for hand-dancing, music and live entertainment, as well as card games and other activities. Hand-dancing, a form of swing-dancing, is an important D.C. institution unto itself. In 1999 the D.C. Council declared it the official dance of the District of Columbia. In 2006, D.C. Mayor Anthony Williams and others celebrated “Seresa Coleman Day” at the Chateau. “Nut” Coleman, who transformed a former grocery store into an iconic D.C. nightclub for hand-dancing, was recognized for creating a family on the dance floor and within the River Terrace community. The Chateau closed in 2016, following Coleman’s death. 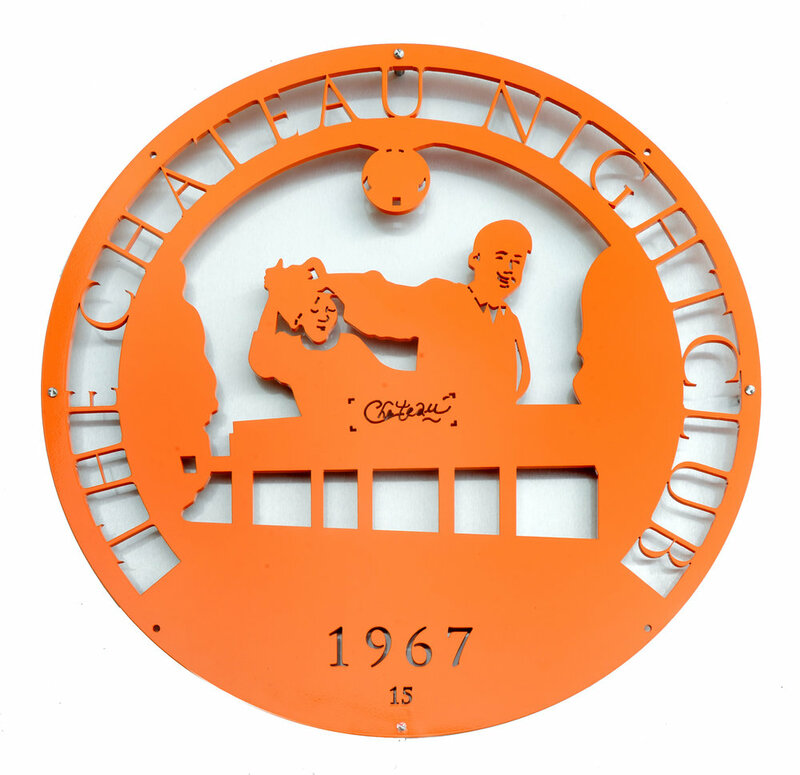 When the nightclub later reopened as the Chateau Remix, the new owners promised to keep many of its traditions. This medallion depicts a couple hand-dancing and the Benning Road exterior of the Chateau. George Gurley (1928-2009), depicted on this medallion, was a longtime River Terrace resident and an early environmental and health activist. Gurley led the “Urban Protector” advocacy organization, which campaigned successfully against the PEPCO Power Plant’s expansion in 1990 and, ultimately, for its closing. The Shell Hydrogen Plant on Benning Road was another of Gurley’s many causes. It was located too close to River Terrace, he believed, so he pressed Shell to make changes to the way it operated the facility. To ensure his work would live on, Gurley taught civic engagement and activism to the next generation. 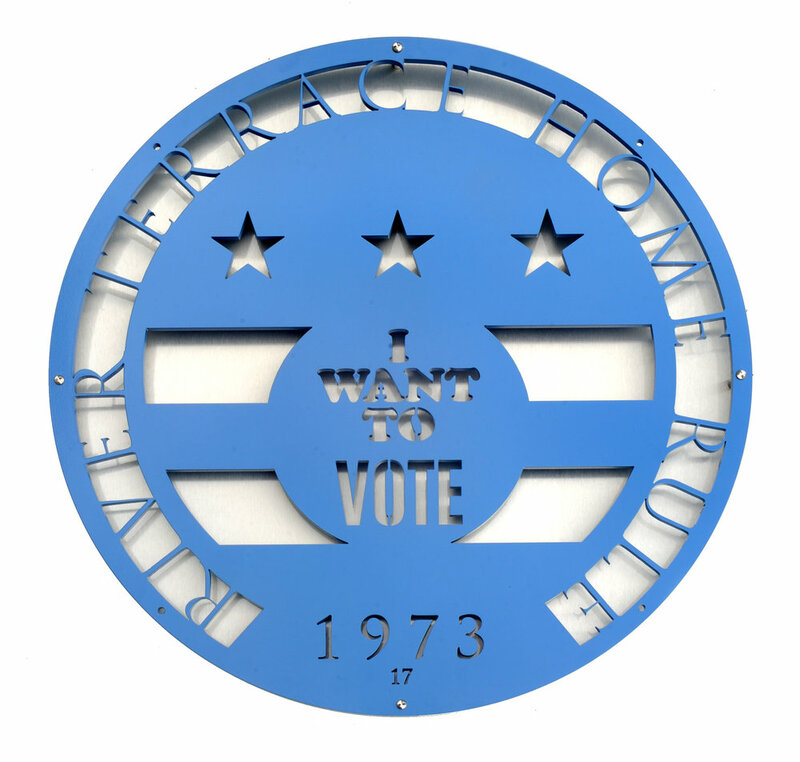 In 1973, Congress granted D.C. “home rule,” with an elected mayor and 13-member City Council. While the District was not granted voting representation in Congress, the D.C. Charter, approved by the voters in 1974, provides for Advisory Neighborhood Commissions, sub-Council bodies whose unpaid members, or commissioners, are elected to two-year terms. Thus, as 1975 opened, River Terrace residents, along with the rest of their fellow Washingtonians, took a big step toward democracy for the District of Columbia. Each ANC commissioner represents about 2,000 residents who live in a section of a neighborhood. Primarily, the commissioners are their neighborhood’s official voice in advising the D.C. government about issues affecting their communities. After vilifying and destroying the Anacostia’s “mudflats” (wetlands) for decades, people began recognizing their importance, and in the 1970s the federal government began protecting them. 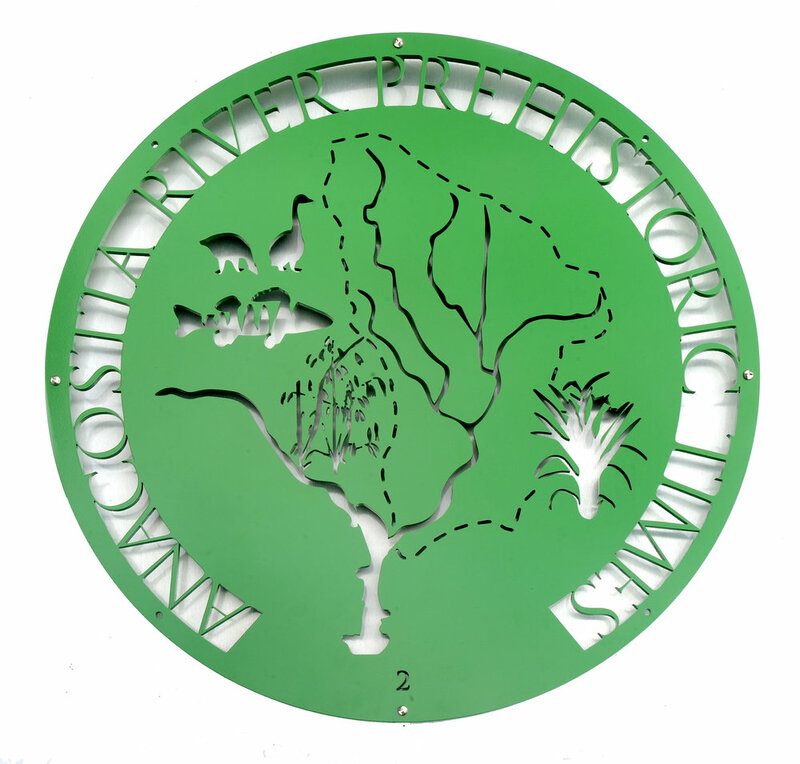 This medallion depicts both the loss of the river’s wetlands as well as their restoration. In the late 19th and early 20th centuries scientists believed the wetlands were the source of malaria and other diseases, so the U.S. Army Corps of Engineers began filling them in. Anacostia Park, in fact, is built on former wetlands. Since the early 1990s, USACE, the National Park Service, and a number of other groups have partnered to restore wetlands, leading to the return of eagles and other wildlife long gone from the area.